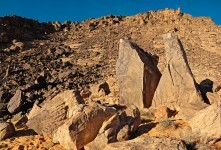 Ghouwtah is a petroglyph locality that is a few kilometers east of Jubbah, just slightly south of the main road that heads due east out of the town. 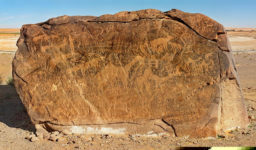 It has two main petroglyphs, both of which appear to be later in age based on the writing, subjects and style. The first, which we call Split Rock, has camels, oryxes, a canid, ostriches, and people who are either fighting or playing games. There is also some Thamudic text. 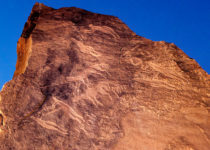 The second petroglyph is a large block with camels, ibexes, carnivores, and a large number of oryxes, as well as humans and text.